For many years changing a flat tire consisted of dragging a jack out of the trunk, manually raising the car and then replacing the tire. Today, an electric car jack can cut the work of changing a tire in half. An electric car jack is a device that is designed to work with your car’s 12V lighter socket and provide enough torque to raise your car easily without manual labor. Instead of cranking the jack by hand in order to change a tire, the electric car jack will raise the vehicle itself. Electric car jacks work using specific hydraulics. These jacks have a much different force ratio or input versus output ratio than manual jacks. This means that they require much less torque or input force in order to operate. 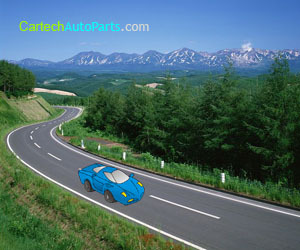 They do require more turns in order to raise a car to the proper height for changing a tire, but the upside is that the turns are not done manually. The motor in the jack can actually turn the jack much faster than you could do by hand. The motor provides many more rotations per minute but provides less force per revolution. The difference is that a manual jack, the type that spins, requires much less rotations per minute but offers more force per revolution or torque. For many, the tradeoff is well worth the reduction in torque because raising the car in order to change the tire is done effortlessly with the help of the electric car jack. The only manual labor needed is to actually loosen and then lift the flat tire and raise the new tire and tighten the lug bolts. Operating an electric car jack is very easy. You simply plug it into your vehicle’s cigarette lighter socket or other 12V socket and then press the on switch. Most models will lift up to one ton without a problem. You then simply change the tires. Electric car jacks are suitable for all cars, many pickup trucks and light vans that have a 12V power socket or a working lighter socket. They are typically sold in cases for easy storage and transportation and have instructions for use as well. An electric jack is not nearly as expensive as one may believe. Most models can be purchased for around $50 depending on the specific model, manufacturer and where you purchase it. More expensive models also have added benefits such as electric lug bolt or nut removers so you have no physical labor needed to change a tire at all unless you count lifting the tire itself. If you are planning to purchase an electric car jack, be very careful that you purchase a product that is designed for the weight of your vehicle. Again, most models will comfortably and safely lift vehicles up to one tone. If however you have a heavier vehicle, be certain that you choose a model that is designed for heavier vehicle use. Features of a standard electric car jack include a plug for your 12V power or lighter socket as well as a longer cord to easily reach all tires. Most models come with at least a twelve foot cord to reach the back tires as easily as the front tires. Most also work using a remote control and feature heavy-duty motors such as those that are 10 amps or more. The jacks normally lift vehicles at least five to fourteen feet in the air for easy access to the flattened tire and the new tire. Electric car jacks are very lightweight as well. Most models weight around ten pounds or just over ten pounds, again depending on the manufacturer and the specific model that you purchase. Some models also feature an overload safety protection feature that will stop the jack automatically if it becomes overloaded with too much weight.